A circular saw makes a useful addition to any toolbox, allowing you to cut a range of materials accurately, efficiently, and safely - optimising work processes and saving time. 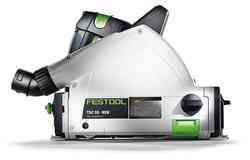 Perfect for making precise straight cuts in materials up to 55mm thick, including interior doors, cutting timber to size and manufacturing expansion joints in parquet floors, a circular saw is a versatile tool that can prove essential in a variety of projects. Our collection of high performance plunge cut saws include the TS 55 R , the Cordless Plunge-Cut Saw TSC 55, and the TS 75 Plunge Cut saw. Features include splinter guards, chip collection bags, brushless EC-TEC motors, flag windows, fine tooth saw blades, and so much more. Designed to offer safe and secure cutting, our plunge cut saws are equipped with the latest safety features, including quick-acting brake systems, and spring mounted guide wedges to minimise the risk of kickback and injury. In addition to our range of circular saws, we also supply a variety of accessories and consumable materials that will optimise and enhance the performance of your saw, including battery packs, rapid chargers, standard saw blades, panther saw blades, and universal saw blades. Of course, if you require any further information about our plunge cut saws, or any of our high quality, performance focused power tools, please do not hesitate to get in touch. Our experienced and knowledgeable team is always on hand to answer any of your questions to ensure that you find the right tools for your requirements. How to identify what size circular saw I need? 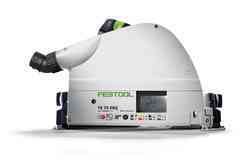 The TS55 plunge saw from Festool enables a guided 50mm depth of cut when used in conjunction with the FS rail system, and a 55mm depth of cut when used with the guide rail. This is suitable for kitchen worktops and most 2nd fix work in the UK.